Rozedes, traditional sweet from honey, almonds, semolina, sugar, cinnamon, clove, kept for many months without losing their exquisite taste. Pastitseto, one of the most authentic and old Kytherian sweets, requiring the finest ingredients: plenty of vanilla, fresh butter, jam quince. Xerotigana, so delicate like lilies and made of natural ingredients: thin crispy leaf, thyme honey, sesame and cinnamon. Arbutus berries, in sweet mouthful size and with sweet and elegant flavor. 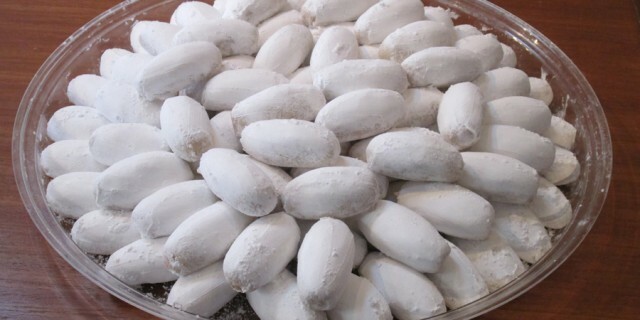 Boutino, the “cake” of Kythera. Prepared with fresh milk, pure butter, local eggs, semolina, sugar, raisins, roasted almonds and grated cinnamon. Try it with ice cream. Melounia, very small delicious honeyed sweets, made from the finest ingredients: honey, almonds, flour, extra virgin olive oil.